By Jeff Aranow: Adrien Broner believes he’s going to be transformed into a boxing legend after he beats WBA ‘regular’ welterweight champion Manny Pacquiao on January 19 on SHOWTIME PPV at the MGM Grand in Las Vegas, Nevada. Broner (33-3-1, 24 KOs) is a sizable underdog going into this fight, and it’s going to take a great performance by him to dismantle the Filipino star on the night. Former four division world champion Broner will be facing Pacquiao on January 19 on SHOWTIME PPV at the MGM Grand in Las Vegas, Nevada. Both fighters have a lot to gain, and a lot to lose from this fight depending on how things go. Broner has more to lose, since he hasn’t won a fight in 2 years, and he’s looked dreadful since 2016. It’s sad to say that Broner has seen better days in his long 11-year pro boxing career, but that’s the gist of it. Broner arguably left his prime behind 2,500 yesterdays ago. It’s been one long, sad slide downhill for Broner since 2013. He’s made a lot of money, but he’s not been a factor since he moved out of the lightweight division. Broner, 29, realizes the significance of this fight, as it could be game over for him if he loses badly. The fans think Broner is going to get trashed by the 40-year-old Pacquiao. Broner has been brought in as the B-side opponent for this fight. During the prime of his career, Broner was always the A-side in his fights, but he’s lost that after suffering losses to Marcos Maidana, Shawn Porter and Mikey Garcia, as well s a draw against Jessie Vargas. “After this victory, I will be taking over the sport of boxing. 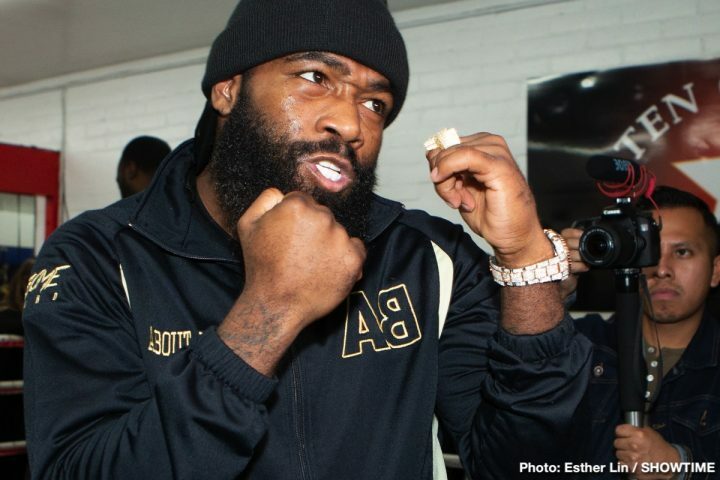 This is just the beginning….this win makes me an icon,” Broner said. A win for Broner would do wonders for his career, opening possible fights against IBF welterweight champion Errol Spence Jr., WBC champion Shawn Porter, WBA Super World belt holder Keith ‘One Time’ Thurman and WBO champion Terence Crawford. A rematch against Pacquiao would be the most likely fight for the Cincinnati, Ohio native Broner. Of course, that’s if Broner isn’t incarcerated for his recent string of legal problems. Broner doesn’t seem to worried about his legal issues. Broner sounds like he just stepped out of a time machine from the distant past, and doesn’t realize how messed up his career has been for the last seven years. If this was Broner from 2012, when he was still a good fighter at lightweight, it would be understandable to hear him talking about himself in such a positive manner. But the way that Broner’s career has turned out in the last seven years, he’s not someone that is on the verge of taking over boxing. The closer reality is Broner is on his way out of the sport, Whether he retires or not, Broner’s days as useful B-side opponent are coming to a screetching halt. If not for Broner’s ability to sell his fights with his trash talking, his useful as an opponent would have come to an end a couple years ago. Right now, there’s nothing that sets Broner apart from the other contenders like Jessie Vargas, Yordenis Ugas, Jamal James, Amir Khan, Egidijus Kavaliauskas and Kerman Lejarraga, aside from his ability to trash talk. “A win here and I’m a legend overnight…I’m already a star in boxing, but a win here and I’m taking over the sport. This is just the beginning,” Broner said. Broner winning four division world titles shows how watered down the divisions have become with the many sanctioning bodies, and their numerous titles that are constantly up for grabs. This isn’t the old days where there was won world title that the fighters would battle over. It’s difficult to imagine Broner winning even one division world title belt if he had to fight the best fighter in each of those four weight classes. Broner would have never beaten Floyd Mayweather Jr. at 147, and he probably would have been wiped out by Regis Prograis at 140, Vasyl Lomachenko at 135, and Gervonta ‘Tank’ Davis at 130. Broner picked out the right guys at the right time for him to win his four division world titles. A win for Broner on January 19 will just mean that Pacquiao is 100 percent a shot fight. It won’t mean that Broner is a “legend overnight” or that he’s “taking over the sport. A victory for Broner will confirm the worst fears that many boxing fans have about the 40-year-old Pacquiao being a shot fighter despite his recent seventh round knockout victory over 36-year-old Lucas Matthysse last summer on July 15. Pacquiao looked great in that fight, but he was facing a guy that was old, and not the same fighter he’d been years ago. Pacquiao should have enough left in the tank to beat Broner, but it wouldn’t be surprising if he loses this fight. Broner says there are blueprints already out there on how to beat Pacquiao from his stoppage losses to Juan Manuel Marquez, Rustico Torrecampo and Boonsai Sangsurat. Broner just needs to follow those blueprints for him to have a chance at knocking Pacquiao out too. Broner has the punching power to do the job, but he’s going to need to land the perfect shot. “It’s not a mystery – he’s been knocked out before,” Broner said. “Not once, not twice, but three times. And he’s been put down a lot, too. There are many blueprints to beat Manny. I think I have all the tools to beat him. I will show all the tools in my arsenal and show all the weaknesses in his,” Broner said. If Broner comes out slugging, it could play into Pacquiao’s hands, because he needs his opponents to want to go to war against him for him do do well. The fighters that Pacquiao has struggled against in the last decade have been counter punchers like Juan Manuel Marquez and Floyd Mayweather Jr. Pacquiao had problems with Jeff Horn simply because of his size, youth, and the way that he was roughing him up the entire fight in 2017. Broner, 5’7″, doesn’t possess the size or the fighting style to rough Pacquiao up the way Horn did. The fight will be taking place at the MGM Grand in Las Vegas, so Broner would never get away with the roughhouse tactics that Horn did against Pacqiao in fighting in his hometown of Brisbane, Australia. The loser of the Pacquiao vs. Broner fight won’t be finished as a fighter. With Premier Boxing Champions, the loser of the fight will still be a useful cog in the machinery to be an opponent for the other fighters.